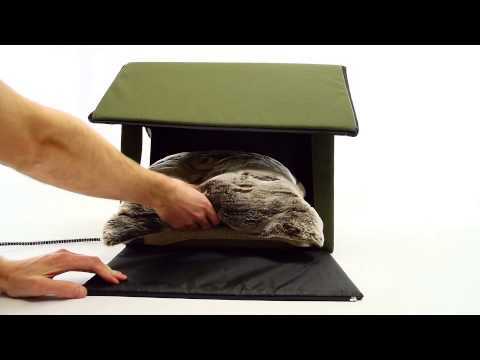 The &H Outdoor Kitty House is lightweight and easy to assemble, yet also strong. A unique design and water-resistant 600 denier nylon allow it to withstand snow and help protect cats from brutal winter weather. The zip-on roof hangs over the two doors to keep cats warm, safe and dry. Front and rear door door flaps provide added shelter while allowing cats to enter and exit the house. These lightweight, clear flaps attach to the inside of the house and can be pushed open easily. The K&H Mfg Outdoor Kitty House includes a small 14" x 18" Lectro-Soft Outdoor Heated Bed, the only patented bed of its kind, and made of a water-resistant PVC material. It features thermostatic controls, a washable fleece cover, a 5.5-foot steel-wrapped cord, and an MET safety listing. Within 5 minutes of setting these outdoor kitty houses up, my barn cats had already investigated and were settled in. They use them every night. A great investment !